The Air Capital Aviators Club, ACAC, was formerly the Boeing Employees Flying Club (BEFC). It is composed of approximately 80 members who are employees or former employees of approved corporate member companies such as Boeing, Spirit AeroSystems, Bombardier Learjet, FlightSafety, Airbus and The Wichita Aero Club, as well as those who have demonstrated a sincere appreciation for a safe, well-maintained fleet of aircraft in which to pursue their love of aviation. Approximately one-third of ACAC members are involved in flight training for private, commercial, instrument or flight instructor ratings. 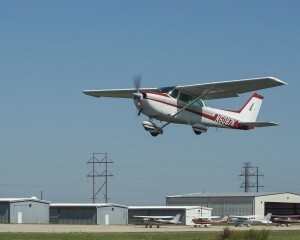 ACAC owns four Cessna aircraft which provide the means for primary and advanced flight training, with policies designed to encourage flying and member use for local and extended cross-country flights. The rental rates for these aircraft are included in this website. Monthly ACAC dues cover ACAC’s fixed costs (inspections, tie downs, insurance, etc.) and provide members with $1,000,000 liability coverage and aircraft damage coverage. Additional renter’s insurance is not required. Members receive itemized bills on a monthly basis. ACAC operations are handled by our Board of Directors who, along with fellow club members, provide their services voluntarily to ensure that the club operates economically and safely. ACAC aircraft are based at the Colonel James Jabara Airport (AAO) Midwest Corporate Aviation (FBO) where services are available 24/7. Aircraft scheduling is available online. The ACAC has several flight instructors to choose from, many are long-term members. Instructor rates are set individually by the instructors and are billed independently from the Club billing statement. Regardless of how you achieve your ground school training (Wichita Area Technical College, self-study, weekend cram course, etc. ), we encourage you to consider ACAC as a source for your flight training. It is an economical and safe way to learn to fly and have fun with fellow pilots at the same time.